Boldly Chic Events: Who will marry us? 1) The wedding ceremony is the most important part of the whole day (though this is often forgotten). So, the person you choose to perform the ceremony should be chosen with care. 2) Choosing someone you know and trust may be more meaningful. 3) You do have a choice, no matter what your church or venue tells you. 4) Before you go out looking, decide what kind of person you are searching for - do you want a traditional priest or rabbi, or do you prefer a judge or mayor? 5) Make sure that the officiant of your choice has legal authority, in your state and county, to consecrate a marriage. 6) Decide who will write the vows. Many couples want to write their own and hand them over to the officiant. 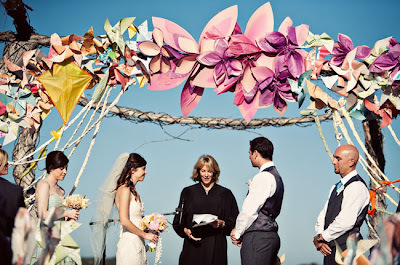 If you would rather the officiant prepare them, that is perfectly acceptable (though I always recommend having them add a touch of personalization to make it really special). 7) Trust is huge. You have to 100% trust the person that you have chosen to stand up there with you and your fiance. Good energy between the three of you is imperative. 8) If you can, without being a crazy person, attend any other weddings that the officiant has performed, do so. If not, ask for recommendations and check them! Many times this decision is put off until late in the planning game. Be sure to spend time asking the right questions and really teaming with someone you enjoy being around. A good officiate will make everyone in the room feel welcome and at ease.